The portraits depict care workers with the people they support each day, ranging from the elderly to the young, people with learning disabilities, physical disabilities or a mental health condition. The minister said: “I wish I could bottle the enthusiasm of some of the inspiring people I’ve met working in adult social care, they sell their profession better than I ever could. With 110,000 vacancies in the sector across England we need more people like them – but as a society we often overlook their vital contribution. 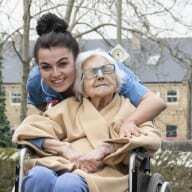 The post Care workers celebrated at House of Commons exhibition appeared first on Care Home Professional.